Sitting in the heart of Silicon Valley, The Startup Legal Garage serves early stage startups from around the country. We provide startups legal resources, free of charge, through our program out of the Center for Innovation at the UC Hastings College of the Law. We assign each participating startup to a legal team comprised of a supervising attorney from a top intellectual property or corporate law firm and two law students from UC Hastings. Our clients come from countless innovative industries, but they each have a tech component that makes them unique. Our supervising attorneys come from top large and boutique law firms in Silicon Valley, including Wilson Sonsini, Goodwin Procter, Pillsbury, Morrison & Foerster, DLA Piper, Fenwick & West, Silicon Valley Legal, Hanson Bridgett, Shartsis Friese, Farella, Braun + Martell, Davis Wright Tremaine, Donahue Fitzgerald, Kilpatrick Townsend & Stockton, Holland Law, Smith Shapourian Mignano, Crowell & Moring, Levine Bagade Han, and more. The students admitted into our highly selective program are from the top of their class. Together, they can provide legal deliverables and advice that are invaluable to an early stage startup's development. Our management team is well versed within the most recent tech news and IP research, and well connected within the startup community. The Startup Legal Garage is an invaluable resource for startups looking to add a formal legal component to their business—a necessary step prior to funding. Get in touch with us to set up a consultation, or use the contact form at the bottom of this page to inquire more about our program. Prepare your new company for the next steps by contextualizing your novel idea within other relevant patents in the field. Your legal team will familiarize themselves with the current patent landscape and advise you on where your invention might fit. You prioritize your users' privacy and you want to comply with the rules that protect it. The Startup Legal Garage's teams of students and attorneys are well researched and equipped to provide the most thorough advisement on your privacy policies and to draft the most appropriate deliverable for your company's needs. Forming your company may be unfamiliar territory. There are a number of different factors to consider when deciding what direction your new company will head. The legal teams at the Startup Legal Garage are well equipped to guide you from the "wet napkin" stage to the next, exciting, stage in your development. The startup and small business marketplace is still a new and fierce frontier that requires legal advice from attorneys who are deeply entrenched in the particularities of venture financing. The Startup Legal Garage teams can provide holistic approach, so your company can get the best competitive advantage. Your employees and vendors make your services possible. The legal teams at the Startup Legal Garage are well versed in employment law and ready to help solidify these new relationships to best serve your long term goals. Use the form below to contact us regarding your legal services. Please be as detailed as possible. Include your industry along with any specific document requests. You may also email or call us to make an appointment. 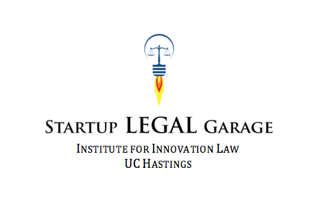 The Startup Legal Garage is an educational program operating out of the Institute for Innovation Law at UC Hastings. The Startup Legal Garage team cannot provide legal advice.